These are some of the strange bangle bracelets I love to make, they can be tricky to manage but they have a neat ethnic flair. Great for layering. Hemitite, Freshwater pearls and Cats eye fiber optic beads. 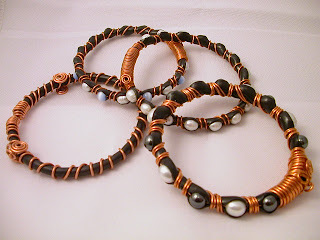 I have used many types of beads but the pearls and hemitite are my favorite... When I wear these, they make me happy!